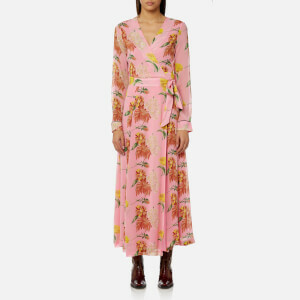 Crafted from graphic floral-printed chiffon, the women’s pastel-hued maxi dress from London-based Self-Portrait boasts a fit-and-flare silhouette with a fitted bust and loose, fluid skirt. Designed with a flattering gathering bust panel with a peekaboo cut-out and relaxed fit cold shoulder sleeves, the dress features contrasting spaghetti straps, waistband and decorative bow detail at the chest. Fastened at the back with a zip closure, the fully-lined dress is detailed with a ruched panel below the waistline.